Kensington, Brooklyn: What, the F? For the second year in a row, the MTA is asking for feeback on the various subway lines so they can analyze the resulting report, sort of shrug, half-smirking, and throw it into a drawer marked "ignore at all costs." It's that time of year again. 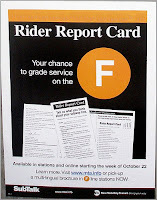 Grab a report card at your F-train station of choice and complain about crowded, late trains. Of course, there's always the chance you're happy with F Service. If this is the case, lavish praise at your discretion. No matter what we all write, you can count on it resulting in a fare hike. Update: reader Joy points out that rather than spend time filling something out and then not bothering to mail it, you can opt to fill the rider report card out online, by clicking here. Thanks Joy!